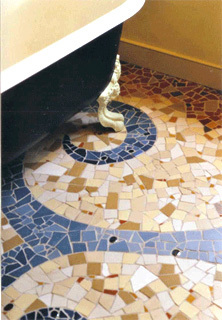 Art4Space specialise in mosaic, an exciting medium that brings art and colour to a space. We can offer a diversity of mosaic styles and use a range of materials, from contemporary interior art pieces to the use of funky textural materials. Our clients have included doctors, designers, architects, private homes, shops and restaurants. Prices are calculated per square metre – including design fee, materials, mosaic work and installation – prices range from £50 per sq metre to £1000 per sq metre.